I was thinking about having cheese and crackers for my strawberry luncheon and the idea of making crackers from scratch struck me. Now previously I had toyed with the thought of making homemade crackers but categorized it with making your own deodorant or sewing your own underwear. Fact is since then, I have seen people online do both and it seemed like it worked out great for them. 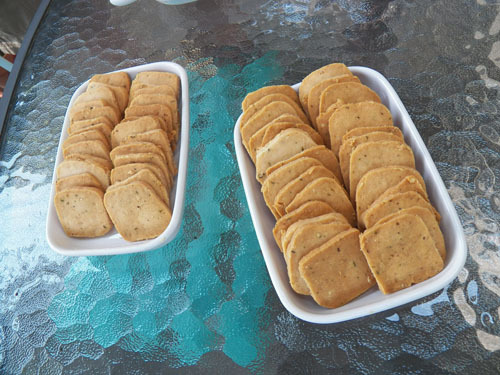 I found this parmesean and thyme cracker recipe and gave it a shot. They didn't turn out as crackery as I expected. They are much too crumbly for speading cheese on... more like a cookie than a cracker. But they are delicious. I am now on the hunt for a more crackery homemade cracker recipe. After that I may be mixing up my own shampoo. 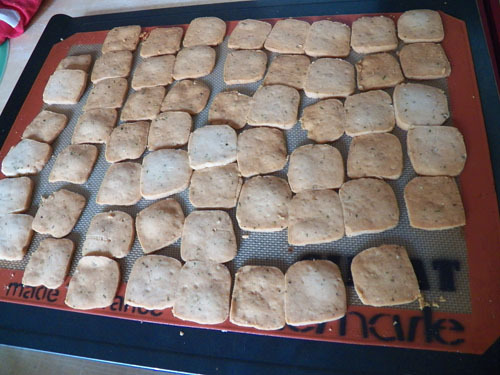 Making your own crackers is definitely Day 20 of 30 Days of Creativity. I just do not think i could make crackers as yummy as carrs does.